Backpacking is a great way to enjoy the outdoors, challenge your body, and stay mentally grounded. Backpacking survival kits help you accomplish this with peace of mind. There are plenty of things to enjoy while backpacking, but there is also plenty that can go wrong. That is where a solid backpacking survival kit can be the difference maker. The peacefulness of your trip can turn bad in an instant: lost tools, inclement weather, and animal encounters just to name a few. The rewards are plentiful when you put yourself out in nature, but so are the risks. Preparing for the worst of the risks before you encounter them makes sense and can keep your trek on track. Even the smallest trips you take should be prepared for. 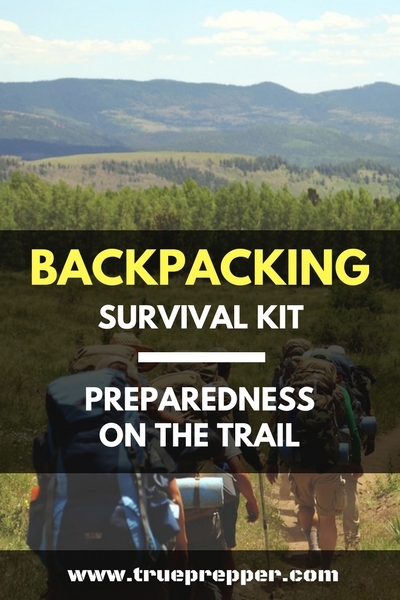 A small backpacking survival kit can be the catch-all for the mayhem and mishaps that will occur. Assuming that backpacking does not come with associated risks is just foolish. Any seasoned backpacker can tell you that hiccups are a part of being on the trail, and that you need to be ready for them. It can be as small as an inconvenient rain storm, or as bad as a standoff with a bear. Being prepared for the worst isn’t just for home or work- SHTF can happen no matter where you are or what you are doing. Knowing your area and gathering information before you go backpacking is one big step that sometimes gets overlooked. Before you go to any new trail, learn a little about the flora and fauna of the area. Make sure you get the weather forecast before you depart and are ready for any changes. Preparedness starts with information gathering and ends with practice- which we will touch on later. And that is especially the case when you are backpacking with limited tools and resources. Many survival kit items packed into a backpacking survival kit are lightweight items that duplicate functionality of other items. Even if you do not have any external threats on the trail, you can easily get around a lost knife or fire starter if you are properly prepared. SOL Survival Blanket (2.6 oz) – This waterproof blanket reflects body heat back at your body. It makes a great impromptu shelter, but be aware that it is fragile and tears easily. This can be used as a benefit though, since you can trim the blanket to line your clothing or for other functions. 550 Paracord (1 oz – 25 ft) – There are so many uses of paracord for survival that we can’t list them all. Don’t leave home without it! Ferro rod (0.5 oz) – Ferro rods make great back up fire sources. Strike a high carbon blade against it for sparks to light your tinder. Remove the keychain and just pack one for reduced weight. Brunton Truarc3 Compass (0.7 oz) – This compass is lightweight and does what it is supposed to do. There are too many tales of people going off the trail and ending up lost with no way to maintain a bearing. Trail Whistle (0.3 oz) – The main goal when you are in trouble is to not just survive- it is to get help. This whistle shrieks out 100 dB tone so people can hear you over a mile away. Gerber Curve Knife (0.8 oz) – A knife is one of the most important components of the kit, being uniquely functional and versatile. Your backpacking survival kit knife should be a backup, so aim for less weight and more versatility. First Aid Kit (2.5 oz) – Don’t leave out the DEET insect repellent and sunscreen. Anti-laxatives should also be packed. The usual bandages and antiseptic make up the majority of the kit. Know how to use everything in a first aid kit, otherwise it is dead weight. ThruNite Ti3 (0.3 oz) – Light is important at night since humans aren’t blessed with night vision. The Ti3 makes a great back-up and can help you see tools and threats in the darker 12 hours of the day. Don’t forget the AAA battery. Vargo Stainless BOT Bottle Pot (4.7 oz) – Stuff your kit in this bottle pot (bot) to keep it all together. It doubles as a water vessel where you can boil the water to decontaminate it. Go with the Titanium version if you are looking for even less weight. SmartWool Trekking Heavy Crew Socks (5.6 oz) – If my time in the military has taught me one thing, it was the importance of a good pair of socks- and a backup pair. Some ultralight backpackers will drill holes in equipment, such as pot handles to get an even lighter weight. Don’t be counterproductive by adding equipment with limited functionality or versatility. High Weight Tools – Machetes and parangs are nice to have in the woods, but you have to consider weight when backpacking long distances. Extra Filled Water Containers – A gallon of water weight 8.3 pounds. Don’t bog yourself down with too many filled water containers if you don’t have to. Being able to find water sources along the way can help you reduce your carried water weight. Always try to have at least 3 liters on you as a safety measure, and just keep your modestly sized container full when there are opportunities to fill it. Road Flares – The chances that this gets wet and doesn’t work or an accident occurs with it outweighs it’s functionality in the kit. Gear for a backpacking survival kit needs to be hardy and able to withstand abuse, and road flares are just not cut out for it. Redundancy – Some items in your survival kit may be duplicate It is better to store duplicate items in separate spots than in the same spot, in case one is lost. Ease of Access – Rapid access may be important when you need to get to your survival kit. It all depends on your anticipated threats and situations. Weight Balance – We all know how important it is to balance your pack weight and a separate survival kit can help balance the load. Although the kits are usually light, every pound matters on the trail. Across the Chest – Counterbalancing a kit across your chest works well for some, and makes the tools easier to gain access to. The downside is that it can get in your way if you are working close to your body. Around the Waist – The fanny pack gets a bad rap, but it is actually a great place to carry equipment. The placement all boils down to personal preference, and where you are most comfortable having it. 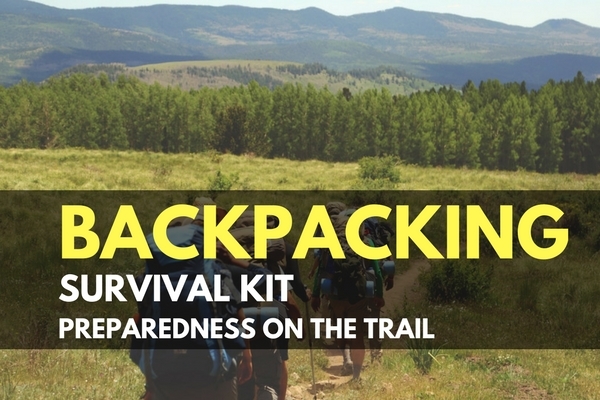 A backpacking survival kit can provide you safety, security, and redundancy on the trail. One important thing to remember about any kit is that they are only as useful as your training will let them be. Don’t stash a kit and let it stay stowed away- break out the components and stay familiar with what you have. This way you can be one step ahead when you need to use the tools in an emergency. Keep exploring, stay prepared, and be safe.